All officers in the department had been out on other high-priority calls when they received the report of two people fighting — so they deployed their newest emergency response tool. Thanks to the footage from the drone, when officers arrived on scene, they knew exactly where to find the woman and man, and what had happened moments beforehand. They arrested the woman for assault with a deadly weapon, but also found the man happened to be riding a stolen motorcycle. The theft was unrelated to the incident. This is how the Chula Vista Police Department has started using drones to respond to calls, as part of a Federal Aviation Administration program. While police departments have already used drones as part of investigations after a crime has occurred, this program sends a drone out ahead of officers while the crime may still be in progress; officers use that footage to decide how to approach the situation. “It gives someone like myself, the Watch Commander, a front row seat to what’s going on,” said Lt. Christopher Kelly. In the six months the program has been active, drones have helped Chula Vista police make more than 56 arrests. For comparison, Chula Vista police made 6,027 arrests over the course of last year. Police say arrests are up since the drone program began in October compared to the same time period last year, but that it’s too early to attribute the change to the drone program. Chula Vista Police Chief Roxana Kennedy said the drones had mostly been operating within a limited range of a mile radius around the station, while the whole city is 52 square miles. 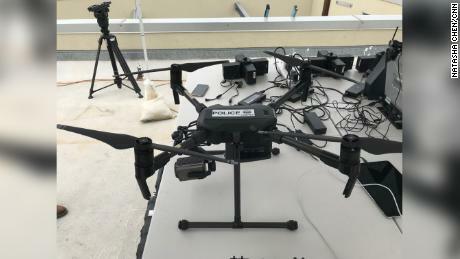 “That being said, the drone has effectively contributed to several arrests where it arrived on scene first and vectored officers to the suspect,” she said. Directed by an officer sitting in the basement of Chula Vista police headquarters, a drone launches from the rooftop. On the roof, another officer sets the geo-fence, a virtual geographic boundary set by GPS, to tell the drone where to go. The pilot on the roof can override the officer directing the drone from the basement if he sees an obstruction, like a flock of birds or manned aircraft, in the way. Federal law typically allows drones to only be flown within the operator’s line of sight. The FAA’s Integration Pilot Program is letting cities across the United States test flying drones longer and farther, for package delivery, agriculture operations, medical equipment delivery and public safety, among other uses. Along with the city of San Diego, the city of Chula Vista is focusing on the area of public safety operations. 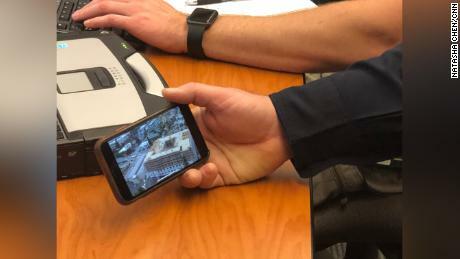 Using an off-the-shelf drone and software from a company called Cape, officers can direct the drone via computer from anywhere. Kennedy, the police chief, said the drone is not a replacement for police officers, but it is a tool to help improve the safety of both officers and citizens they’re sworn to protect. “It’s a game-changer for law enforcement,” she said. While a 911 caller may be distraught and may give incomplete or inaccurate information, a drone can get there faster than a police car and zoom in for a closer look. Kennedy said that the zoom feature on the drone’s camera allows officers to see a license plate from two miles away, and that kind of tool helps them make better informed decisions and plot a smarter strategy. She said she hopes it could help avoid deadly force incidents — giving officers a chance to assess a situation and to think about how to defuse it before rushing onto the scene. “Just this morning we saw one come. Someone called about somebody in their yard, and the first thing we saw was the drone,” said David Ward, who lives in the city. Some Chula Vista residents have questions about the drones overhead. “It might help solve crimes. But I think drones are a little bit of a violation of privacy. Can they look in your window?” said Marie Paniagua. The police chief said the department has done a lot of work to get the community’s buy-in. Ward said he wants to know whether citizens have a right to see the footage collected, “but I believe that they’re doing it to protect people’s safety,” he said. Kennedy said Chula Vista has the lowest staffed police department in San Diego County, with 242 sworn officers covering the 52-square-mile area. The eventual goal, she said, is to be able to at least get one drone over a scene within two minutes of a radio call, and to have the drones placed at police stations and fire stations around the city. Capt. Vern Sallee describes the project in three phases: crawl, walk, run. “We’re getting feedback from them (the FAA) as to what they need to have confidence in our systems, in our drones, to start changing the rules to better integrate drones into the national air space they control,” Sallee said. And last month, Chula Vista police drones got clearance to fly farther. On March 15, the FAA granted Chula Vista PD the first-ever certificate of authorization with a “beyond visual line of sight” provision for an Integration Pilot Program participant that allows for proactive emergency response. That gives them a 40-mile flying radius, according to Cape — and police say those longer drone flights have already started.